Pulse Amplitude: Adjustable 0 to 80mA into 500 ohm load, each channel. Wave form: Modified square with zero net direct current (DC) component. TENS/EMS Units & Stimulators can be found in our extensive online collection of products from globally recognized and trusted brands, including ProMed Specialties. 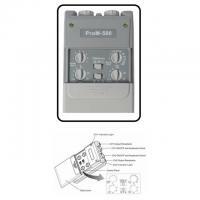 An excellent option to consider is the ProMed ProM-500 Electrical Muscle Stimulator.